I'll be picking up from my favorite farmer Saturday morning, and Raw Paws CoOp next week. 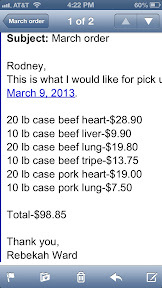 Screenshot of my order from Rodney, my favorite farmer. The usual beef and pork hearts and lung, along with 10 lbs of beef liver. I'm most excited about the green tripe chunks. 90 lbs of boneless meat for less than $100 is a good deal in my opinion. Screenshot of my coOp order. I didn't order much, and I'm regretting that decision. I'm fearful I will run out before I pick meat up in April. Some duck hearts, which Neeko seems to really love. Ground venison and green tripe from Blue Ridge Beef. 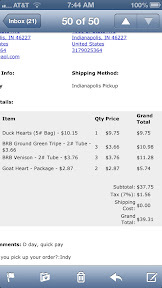 I ordered two packages of goat hearts. I'm hoping each package is two lbs, or I'm going to be disappointed. I have ordered 10 lb packages of goat hearts from Raw Paws for $1.45 per lb in the past, and this offers species variety. Those are some great prices, too! Lucky doggies!